Soft and generous, a style you can live in every day! It has a flattering 'V' neckline, and the wide rectangular shape falls languidly over all your yummy curves. The way this fits so many different figures is pure design magic: big and cozy in the S-M-L range; billowy in the XL-1X-2X range; perfect on sizes up to 3X-4X, and possibly 5X with its @70" bustline... it floats like a cloud of yumminess on all! Like all of our garments, it's indescribably soft and comfortable, impeccably constructed, built to last. 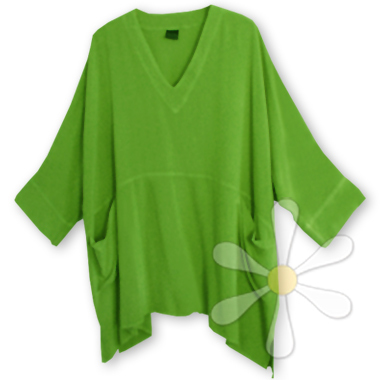 Our best-selling 'everywear' tunic!